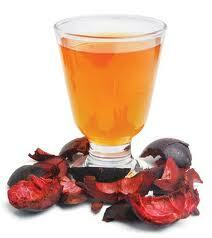 MANGOSTEEN-CALAMANSI TEA: GREAT THIRST-QUENCHER FOR KIDS! As a parent who only wants the best for the kids I can clearly understand the dilemma that most parents go through. We easily get worried of the food that they eat outside the home and we can’t really monitor their diets each and every time especially if they’re in school or somewhere else. Now that summer is just around the corner, kids will most likely crave for thirst-quenchers. And again it triggers my worry cells to no end! Kids can consume liters of iced tea,powdered juice and all those artificially processed drinks that can hydrate but don’t have essential benefits for the body. 1. Let the mangosteen rinds dry out, preferably in room temperature. 2. Boil the dried mangosteen rinds, use strainer and set aside boiled mixture. 3. Squeeze some lemon into the boiled mangosteen mixture, put sugar to taste and voila, you now have mangosteen-lemon tea ready for serving! You can chill the mixture inside the refrigerator or you could enjoy it pronto, just add ice cubes! The kids instantly loved it and my two boys almost finished up a pitcher-full of this healthy tea! 1. Mangosteen has great anti-bacterial and anti-fungal components and most of all it has anti-oxidant properties. 2. Mangosteen is anti-inflammatory and contains minerals like magnesium and potassium which helps protect the body from heart disease. 3.Most of all, mangosteen boosts energy, a great source of Vitamin C, helps prevent anemia and has essential properties that’s good for the skin. AND YES, CALAMANSI is a great source of Vitamin C, so you’re really sure that this tea concoction is not just all-natural but really healthy for our kids and family!! September 21, the date to remember!! Yes folks, Jessica Sanchez will definitely invade Manila with fellow American Idol finalists!! Honestly, I was not too keen with American Idol before but since I saw her during AI’s Season 11 it was really a blast! Well, not only because she is half Filipina but what appealed her to me was her singing prowess and boy,she seems to have these massive lungs!!! Her rendition of well-loved songs during that season was also awesome, completely breathtaking!! I love all the songs she sang but these are my favorites, so far!! Oh yeah, actually it’s so hard to choose because she sang all of them effortlessly. And the finale number with Jennifer Holiday?!!!Wowww!! Hey Jessica, we’re all waiting for you here in the Philippines! !I may still be miles away from Manila, but just knowing you’ll be in the Philippines soon sure feels like a piece of heaven already!!! Hi friends, there is so much I wanna share so I thought of putting up this blog. Stick around and we’ll have fun, that’s for sure! !